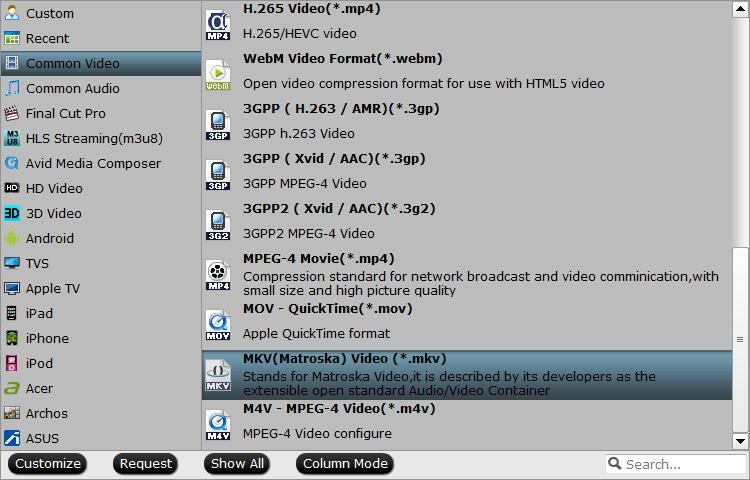 The Matroska format is a multimedia container envelope for video, audio and subtitle files. The MKV format has many advantages over competing containers. – It is open source, and thus making the code freely available to developers the world over, and to the public. 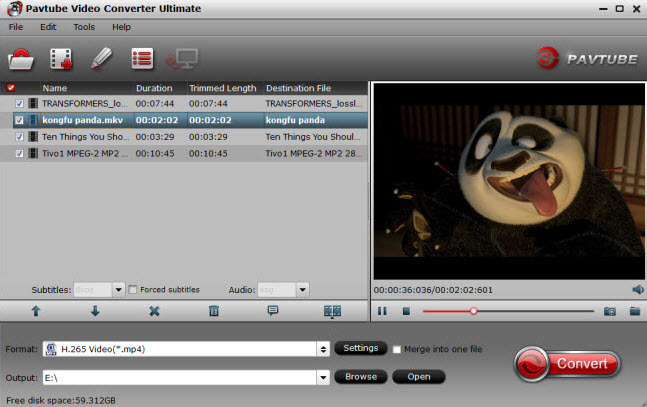 – The MKV format supports menus like a DVD, chapters, and multiple audio streams for the inclusion of audio tracks in different languages. – Soft subtitles are also supported in the MKV format. A soft subtitle is a separate subtitle track within the container that can be turned off or on by the user. – MKV can contain variable bitrate audio and variable framerate video, plus B-frame compression. – The MKV format also supports virtually any audio format, including lossless audio like FLAC, and audio container formats like Ogg. It also supports Speex, a lossy format for compressing audio speech. Why need a MKV Video Converter? Even MKV allows you to contain a robust amount of data in a small package, however, it isn’t exactly widely supported. You may smoothly play it on the free open-source multimedia player – VLC, but you may have no luck to get it recognized by the household media players like Windows Media Player, QuickTime, iTunes, etc. To fix that compatibility issue, you can convert MKV to a format that’s compatible with most modern devices and media players. As we have mentioned above, MKV offers a richer media experience than any other current format. Therefore, it quickly become the preferred file extension for high definition video on the Internet. For Blu-ray/DVD disc owners, it would be a good option to rip Blu-ray/DVD disc to MKV format if you wish to preserve the multiple audio tracks and subtitle languages in original Blu-ray/DVD movies. In addition, if your original Blu-ray movies offers 5.1 or 7.1 surround sound, you can pass-through them when you choose to backup your Blu-ray/DVD to a lossless MKV file format. – Supports 6x faster speed when encoding MKV to H.264 codec on a computer with Nvidia Graphic cards that supports Nvidia CUDA or AMD App technology and up to 30x faster speed when encoding MKV to H.265 codec on a computer with Nvidia Graphic cards that supports Nvidia NVENC technology. - Output video with perfect quality. There is almost no difference between the result video and the original video. Tips: For those people who wish to digitize Blu-ray/DVD with no quality loss, we highly recommended you to download Pavtube ByteCopy (review), which helps to beneficial copy 2D/3D/4K Blu-ray/DVD to lossless multi-track MKV format with all the original subtitle languages, audio tracks and chapter information well preserved. In addition, this format will enable you to pass through 5.1 surround sound like Dolby Digital or DTS and 7.1 surround sound like Dolby TrueHD or DTS-HD Master audio in original Blu-ray or DVD movies to get the best audio quality. Tips: 5.1 is the industry standard and is used by most DVD and Blu-ray disks, as well as by HDTV and video games. It is also the most common sound system in commercial theaters. Most Blu-ray players support 7.1 sound, as does the PS3. Most DVDs, Blu-ray disks and games are still produced using 5.1 audio, but an increasing number of Blu-ray disks are being released with 7.1 sound as well. Step 1: Import MKV files or load Blu-ray/DVD disc. Download the free trial version of the program. Launch it on your computer. Click “File” menu and select “Add Video/Audio” or click the “Add Video” button on the top tool bar to import video audio not synced MKV files into the program. For loading Blu-ray or DVD disc, Insert your Blu-ray or DVD disc into your computer’s optical drive , hit “File” > “Load from disc” option. Tips: Check the MKV or Blu-ray/DVD movie titles you want to convert or rip. Click the drop-down list of Subtitles, then all the subtitles info in the MKV video or Blu-ray/DVD movie will be shown clearly, so you can select your needed language as your subtitles freely. Clicking the Format bar, from its drop-down list, if you wish to output MKV to other popular file format, just choose a more wide supported format such as “H.264 HD Video(*.mp4)” under “HD Video” main category. If you wish to rip Blu-ray or DVD to MKV, just following “Common Video” > “MKV (Matroska) Video (*.mkv)”. Tips: Click “Settings” on the main interface to open “Profile Settings” window, here all the profile parameters including video codec, resolution, bit rate, frame rate, audio codec, bit rate, sample rate, channels, etc are adjustable to facilitate you to get the best output video and audio quality. 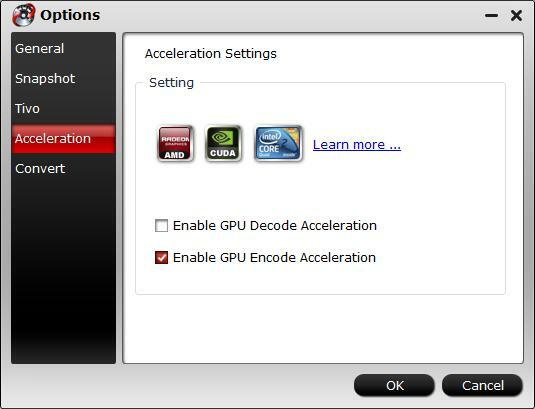 Click “Tools” > “Options”, in the opened “Options” window, click “Acceleration” menu, then check “Enable GPU Encode Acceleration” otpion so that the program will accelerate converion speed when encoding video to H.265/HEVC codec. Step 4: Begin the video encoding process. Go back to the main interface, hit the right-bottom “Convert” button to start converting MKV to your desired file formats or encoding Blu-ray/DVD to MKV format. When the conversion is completed, feel free to play MKV files with your desired subtitles on any media players, devices or programs you like.